The Mazdaspeed3; The Hot Hatch Time Forgot. Car enthusiasts are a hard group of people to please. But it wasn’t always this way: it used to be that in order to please a car enthusiast, all you needed was a big engine in a smaller car so it went fast. That formula worked great for a while. Then the 70s brought the oil embargo and high gas prices. Consumers couldn’t afford a big engine that drank gas like a drunk, they needed something more practical. Automakers responded by inventing the midsize sedan, and making the hatchback sportier. However, the hatchback formula at the time didn’t look as good or sell as much as the sedan. By the 90s and 2000s, the SUV, a form of vehicle that is really hard to make sporty, was on the rise, and the hatchback become far more stylish, and often desirable over the larger sedans. The enthusiast still wanted something fast, fun to drive, and sporty. But, they also wanted a practical, fuel efficient, reliable vehicle: something we could drive on the weekday and tear up track with on the weekend. So, Ford gave us the Focus ST, VW gave us the Golf GTI, and Mazda gave us the Mazdaspeed3. All powerful hatchbacks that were fun to drive, efficient, and practical. But only the Focus St and the Golf GTI remain today; the Mazdaspeed3 disappeared and many forgot about it, which is a tragedy. The Mazda Mazdaspeed3 first made its appearance in 2007. 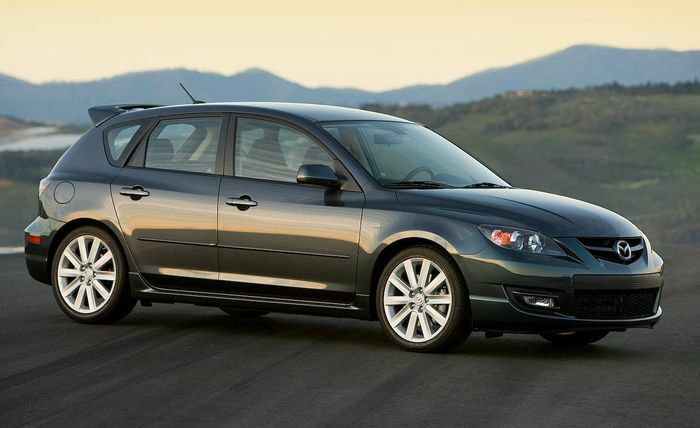 It was a 5 door hatchback that looked really similar to the standard Mazda3 hatchback, but, the larger wing, beefer tires, and louder exhaust quickly let you know that this was no normal hatchback. Especially as you saw its taillights getting smaller as it left you in the dust at the stoplight. 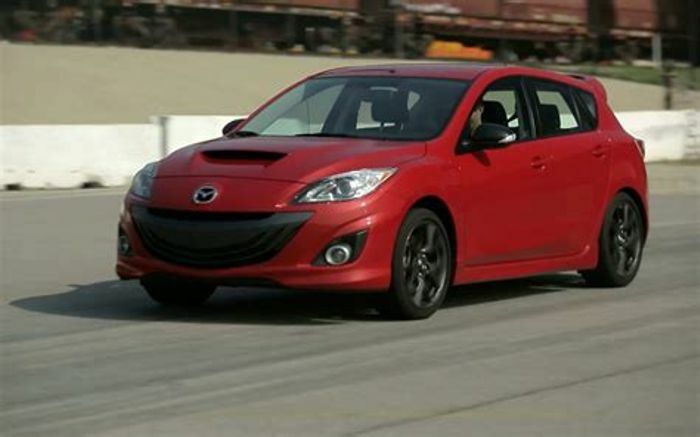 The Mazdaspeed3 boasted a turbo charged 4 cylinder which made 263 HP and 280 pound feet of torque powering the front wheels, mated to a 6-speed manual transmission— the only transmission available. 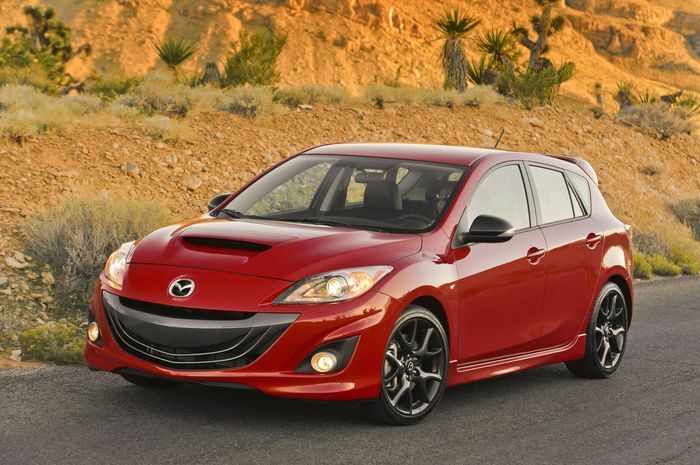 The Mazdaspeed3 went from 0-60 MPH in just 5.5 seconds, and ran a quarter mile in 14 seconds at 103 MPH. It took the GTI a second longer to get from 0-60, and almost a second longer quarter mile time at 94 MPH. The handling was also better than that of the GTI: Car and Driver Magazine named the Mazdaspeed3 to its top 10 list of best cars. To say that the Mazdaspeed3 was better than big enthusiast cars like the Subaru WRX was a big deal, and a big boost for the car’s reputation. Critics praised the car’s handling, composure in the corners, and fast acceleration off the line. However, many were critical of the torque steer, where the car pulls in one direction when you smash the throttle, calling it excessive, and also ragged on the Mazda’s harsher ride compared to its competition. But overall, the Mazdaspeed3 was a hit with critics and enthusiasts alike. In 2010, Mazda released the second generation of the Mazdaspeed3. The styling was updated to reflect the design language of the rest of the Mazda fleet, most noticeably in the form of the big whale or “Pixar” smile grille. But the hood scoop, rear wing, and 18in wheels still gave clues to its performance nature. The question is, will that smile on the car transition to a smile on your face while driving? In short, yes. The second generation speed3 didn’t lose horsepower or torque outputs compared to the original, still boasting 263 HP and 280 pound feet of torque, with a similar 0-60 time as the first generation at 5.8 seconds, and a quarter mile time of 14.3 seconds at 100 MPH. This time was slightly faster than the Ford Focus ST. The new speed3 also limited boost in 1-3rd gears to manage the torque steer issue. Critics agreed that the torque steer was better than the previous speed3— it was notable, but easy to get used to— but it still failed to match the Focus ST. The critics enjoyed the ride, though it was still a bit rough, and the handling too, although some understeer was noticeable. The interior got mixed reviews: the sports seats either did a good job, or they didn’t; either you liked the dash layout, or you didn’t; either you liked the red inserts in the seats, or you didn’t. In short, just like the smile on the front, either you like it or you don’t. However, critics agreed that the speed3 would at least never fail to put a smile on your face and wallet for years to come, thanks to Mazda reliability. With a meaty and loud exhaust to top off the package, the speed3 was a solid choice for on track performance and daily driving alike. Then in 2013, with buzz of the new Mazda3 being released and speculation of features for the new speed3, such as it having AWD (All Wheel Drive,) for the first time, Mazda announced that the there wouldn’t be another Mazdaspeed3. But they could never quite explain: why? And, why does it seem that so many people have forgotten about the speed3? The speed3 was a solid competitor with the Focus ST, Golf GTI, and WRX; critics liked them, and owners loved them. I think there are a few reasons for its cancellation, and falling between the cracks more recently. In 2010, Mazda, with the help of many private firms, reduced Ford’s shareholder stake in the company to 3%. This meant that Mazda would have more control of its lineup and the brand’s image and future. Mazda had been talking about moving toward a more premium look for years, and with a full redesign coming up soon, this was a perfect opportunity to forward that idea. Having a powerful, and let’s be honest, immature hot hatch doesn’t exactly fit that “upscale” image market that Mazda wanted to convey. Another reason is more straightforward: sales. While the Mazda3 has long been a solid seller for Mazda, the speed3 wasn’t. Some reports put sales at a meager 6,000 units a year, at best. Mazda is a low volume dealer, and they have very little wiggle room to support niche market cars: with both the Miata and the speed3, one had to go. The Miata had better name recognition, less competition, and there was some sentimental value in that it saved Mazda in the 90s. So the company made the logical choice, and cut the speed3. Another factor was the changing demographics. The average age of new car buyers has been getting older, now around 51 years old. The speed3 appeals to a much younger demographic, which translates to overall lower sales. The Mazdaspeed3 was loved by critics and owners alike, but many people have either forgotten or don’t know that Mazda even made performance models of the 3, 6 and Miata; but why? Well, one reason is, again, that Mazda is a low volume operation, and the Mazdaspeed lineup was an even lower volume operation. Ford and VW sold quite a few more of their hot hatches and have better name recognition compared to Mazda. Their models also tended to be more refined compared to the Mazdaspeed models. The Focus ST had a better power delivery, while the Speed3’s power hit you hard and fast. This makes for fun driving, laughs and smiles, but it can make daily driving more challenging and affects handling on the track. But, no matter how you slice it, Mazda made some great performance models and its a shame that they killed Mazdaspeed here in the US. Mazda took the old American formula of lots of power shoved into a small package, tweaked it by adding practicality and reliability, the end result was pure fun. Although there has been some speculation since Honda brought the Type R back to America, that the Mazdaspeed is due for a revival. However, given the direction Mazda is going, I don’t see the Mazdaspeed lineup returning anytime soon. Which is unfortunate for car enthusiasts everywhere who want a little more “Zoom Zoom” out of their Mazda. What do y’all think? Will Mazda bring back the Speed3, or have we seen the last of Mazdaspeed? Let me know, and what y’all think of my post in general, in the comments! Recommended car throttle shop Worldwide Shipping In The CT Shop Car Throttle Submit Your Videos To Get Featured On Our Social Channels Blog The Grand Tour’s Emotional Latest Ep Reminds Us What We’ll Soon Be Missing Blog Here's Why A ‘Four-Door Mustang’ Could Work... But Probably Wouldn't Blog How The Right-Size Wheels Transformed Two Of My Cars Blog 8 Exciting Car Reveals To Look Out For In 2019 Blog The New Rush Of Affordable, Desirable EVs Finally Makes Sense Blog Only Two Nordschleife Records Matter, And All Others Need To Stop Blog Audi’s Ironic Move Back Towards Diesel Is Ridiculous But Intriguing Blog Why Is Ford Resurrecting The Defunct Puma Name On A Crossover?